S.M. Shah & Company is an authorized distributors and Importers of INTERMOT make Orbit Gero-rotor type Low speed High Torque Hydraulic Motors and Orbital Hydraulic motors (Low speed High Torque). They are one to one replacement for DANFOSS OMP, OMR, OMS, OMT, OMV series motors. 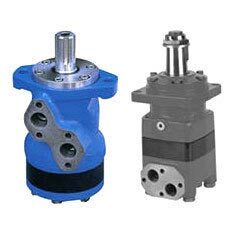 Hydraulic motors are rotary Hydraulic Actuators which closely resemble the pumps in construction. These motors are a kind of inner gearing orbit motor on the principle of planetary reduction. There are two forms of distributions: with shaft distribution flow or with disc distribution flow. This product is a simple structure showing good performance under low speed and short time overhauling. Instead of pushing on the fluid as the pump does as output members in the hydraulic system they are pushed by the fluid and develop torque and continuous rotating motion. Since both inlet and outlet ports may at times be pressurized most hydraulic motors are externally drained. It has great advantages for its small volume, low weight and high output torque. These motors have wide applications in construction engineering, agricultural machinery, transportation, oil or coal miners, adjusting mould in plastic injection molding machine etc. S.M.SHAH & CO also offers Low speed High Torque Radial Piston Hydraulic Motors with high displacement & torque. It is a low noise motor due to an eccentric crankshaft & low vibration frequency of five piston design. Due to high starting torque & good stability it rotates under very low speed. There are seals between piston and cylinder which give high capacity efficiency & less leakage with high reliability. Oil is supplied by the pump to the distributor valve spool of the motor. The valve directs the oil in to two cylinders. The crankshaft rotates as piston in these cylinders push down on its drum. The remaining cylinders exhaust their oil back through the valve to exhaust port. The valve is keyed to the crankshaft so both rotate together and port oil to each cylinder in succession. Roller bearings are used in between crankshaft & connecting rod which gives high mechanical efficiency. These motors have reversible rotation & output shaft can bear axial & radial loads. These motors have versatile construction design, high power and low weight. In addition to this fact we are the most reputed Hydraulic Pump Motors Exporter in India.